As one of the oldest celebrations in Italy, the Venice Carnival is celebrated until the beginning of Christian lent. It’s considered one of the most unique experiences in Italy, rich in history and a magical, enigmatic experience. Venice Carnival participants go all-out with their fantastic, elaborate costumes. The history behind the carnival is intriguing, and goes back all the way to the 11th century! Let’s discover the secrets and splendor of this world-famous carnival that takes over Venice for two weeks. One of the main themes of the carnival revolves around the wearing of masks and costumes—particularly those themed around centuries passed. The idea behind this in the Venice Carnival’s early beginnings is that nobility could not be distinguished from commoners, making every stranger a mystery. These masks were worn during balls, and while originally they were not allowed to be worn in the street, they eventually became commonplace as the festivities grew each year. Part of what draws so many to the Venice Carnival is its atmosphere and spirit. It’s about being free and allowing oneself to play in the festival and its many splendid events. In centuries passed, the carnival was a place to gamble, make mistakes, take chances, and tempt fate. Today, it maintains this jubilant feel, encouraging its participants to succumb to the fantastic sights and sounds. While there are differences, the fantasy-driven atmosphere, balls, parties and celebrations remain yearly in Venice. It draws a large crowd of locals, as well as visitors who travel just to experience this exciting event. Anyone visiting the Venice Carnival will witness elaborate costumes and an abundance of music and colors. Those seeking a new breath of life often turn to the carnival’s energizing experience to rejuvenate. On the outside, it may just seem like a celebration akin to Mardi Gras, but it truly is a force to be reckoned with. 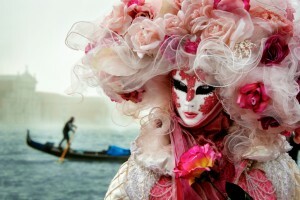 Travel to Italy and see the Venice Carnival in person! This entry was posted on Thursday, February 4th, 2016	at 4:00 pm	. You can follow any responses to this entry through the RSS 2.0	feed. Both comments and pings are currently closed.